Over the past few weeks I have been involved in a research project involving the actress Audrey Hepburn. In the process, I have been able to catch a glimpse of her artistic preferences and artistic talent, which has been fun. 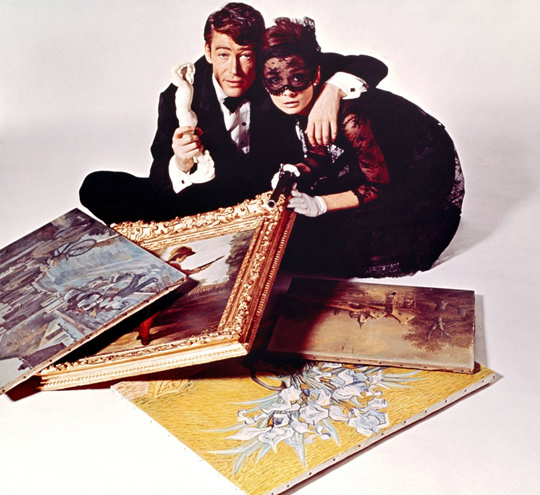 Before this project, my only connection with Audrey Hepburn and art was her role as an art forger’s daughter in How to Steal a Million. Audrey Hepburn was quite private about her personal life, but I have been able to extrapolate a few things that suggest her own preference for art. Audrey surrounded herself with art and beautiful things like flower gardens, but she also created art. As a child, she also would sketch and draw. These works of art, which were created in the 1940s, seem to serve as a type of escape from the horrors that she experienced while living in Holland during WWII. 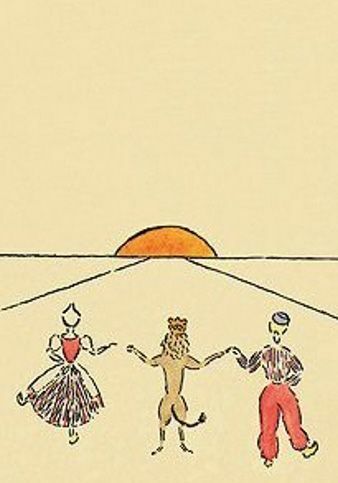 Some of my favorite scenes include one with a Dutchman and Dutchwoman in clogs who are walking toward the sun, while holding hand with a lion who is wearing a crown (see here) or a compilation of drawings that are inspired by fantasy scenes or nurse rhymes. As an adult, it seems apparent that Audrey Hepburn and/or her husband Mel Ferrer (married 1954-1968) liked the art of Picasso. 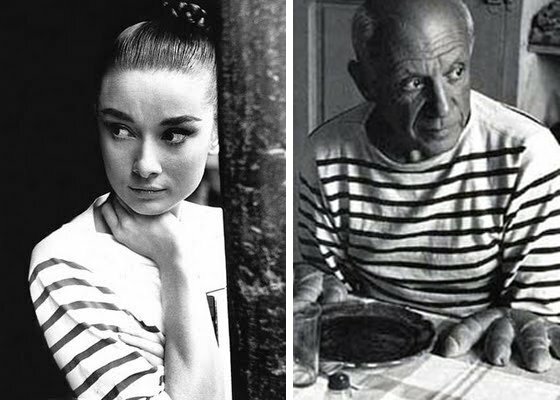 (Others have also noted that Audrey Hepburn and Picasso had a similar sense of fashion, since they both wore sailor stripes.) Hepburn attended Picasso: 75th Anniversary Exhibition in 1957, which includes a lovely photograph of her standing next to Picasso’s Self-Portrait with Palette (1906). 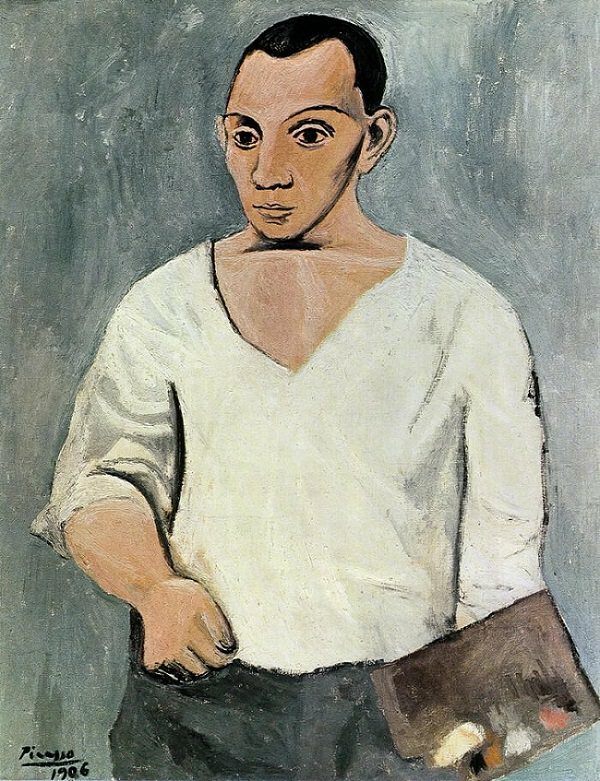 In addition, the news reported that a drawing by Picasso was stolen from her home in 1962. I couldn’t find any reports as to whether this drawing was ever returned – where did it end up, I wonder? Do any readers know what this drawing looks like? Audrey also created her own art, too, and I think that some of her personal artistic style might have been indebted to a little to Picasso, but especially Van Gogh. 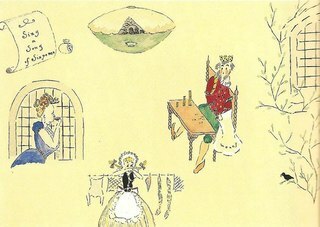 At present, I am only aware of one work of art which has been shown to the public, which is Flower Basket at La Paisible (scroll through images on linked site to see painting).1 This painting was created at her home in Tolochenaz, Switzerland in 1969, when Hepburn was pregnant with her son Luca. The style reminds me a little bit of that of Van Gogh, particularly in the outlines and strokes that are used to create the texture of the wicker basket handle (for comparison, see Van Gogh’s Still Life with Basket and Six Oranges). Hepburn’s buildup of impasto, particularly within the petals of the flowers, also reminds me of Van Gogh. 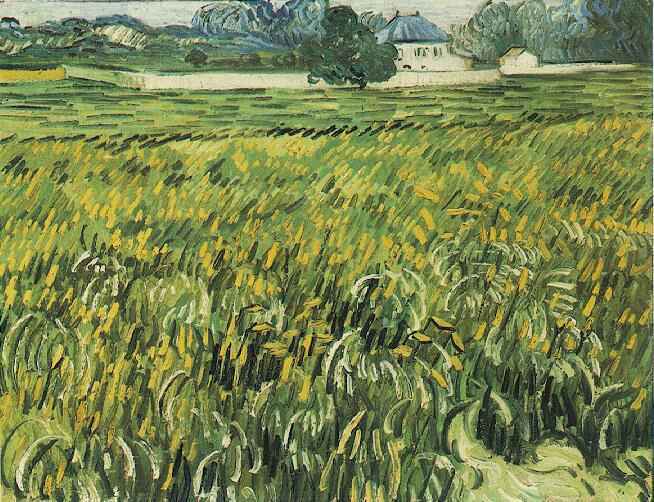 And the green and yellow strokes in the upper corners of Hepburn’s painting remind me of Van Gogh’s paintings of fields, such as Wheat Field at Auvers with White House (1890). 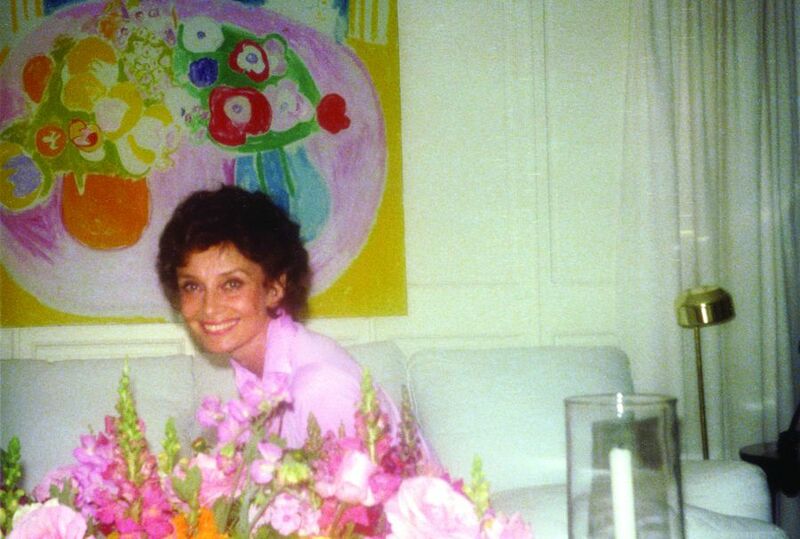 I think it’s likely that she also created the painting behind her in this photograph of Hepburn in her home (although the reduction of the vases and flowers to shapes and colors, as well as the gradients in color saturation actually remind me a little more of Matisse than Van Gogh – see Matisse’s Anemones and Chinese Vase). I also think that Audrey may have preferred some older art as well, based on where she lived. When she was married to Andrea Dotti, they lived in the center of Rome in a penthouse that used to be a cardinal’s palace. The space was decorated with soaring ceilings and painted frescoes.1 I haven’t been able to find more specific information on this penthouse (or the frescoes depicted therein), but if anyone knows information on this topic, please share! Audrey especially loved gardens and the “living art” provided by flowers. Her personal interest in gardens even helped influence her decision to host a documentary series, Gardens of the World (see trailer above). PBS didn’t have the money to pay for Hepburn to have a stylist, but Hepburn insisted that she could do her own wardrobe, hair and makeup for the project. Gardens of the World aired in 1993, shortly after Hepburn’s death. Hopefully we will continue to learn more about Hepburn’s interest in art (either collecting, creating or viewing art) in the years to come. In 2014, Hepburn’s son, Sean Ferrer, mentioned that several works of art were left behind in Hepburn’s personal effects. It could be that, in the years to come, we will see these works of art put on auction to help raise money for the Audrey Hepburn’s Children Fund. 1 A good reproduction of this painting is available on p. 229 of Sean Ferrer’s book, Audrey Hepburn: An Elegant Spirit. 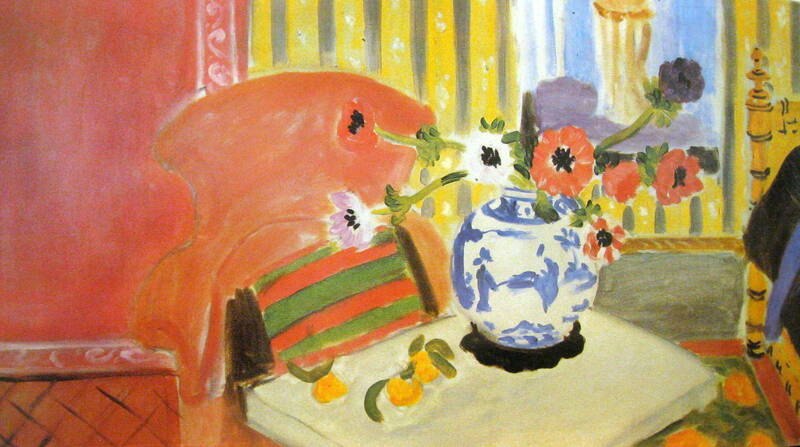 I am hoping to secure permission to post an reproduction of the painting on this site. 2 Donald Spoto, Enchantment: The Life of Audrey Hepburn (New York: Three Rivers Press, 2006), p. 271. My different art experiences are colliding this week in an unusual way. 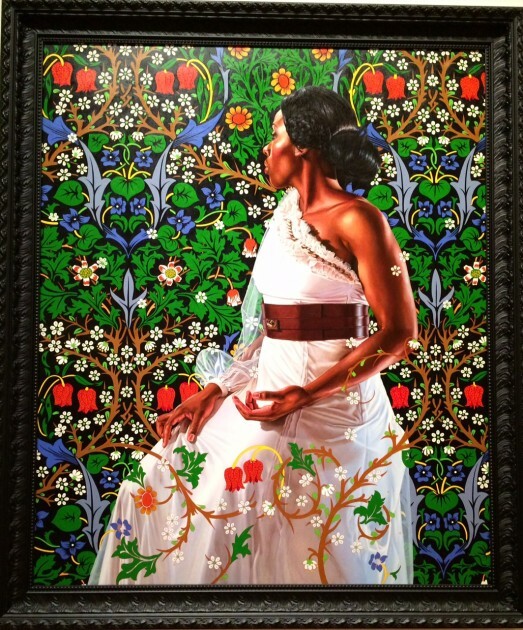 This past weekend I went and saw the exhibition Kehinde Wiley: A New Republic at the Seattle Art Museum. 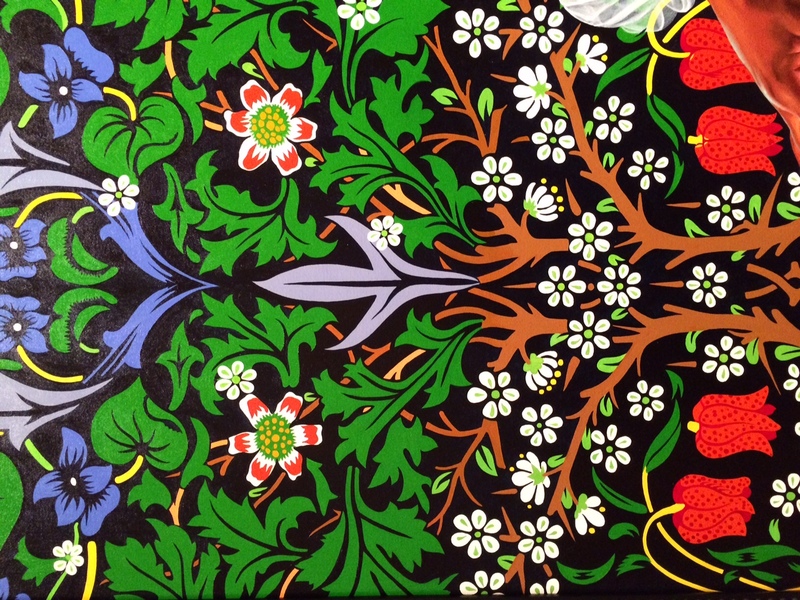 And then, just today I taught my students about some of the designs that appear in William Morris’s wallpaper. When I got home this afternoon, I began to think about how some of William Morris’s work is referenced in a few of Kehinde Wiley’s paintings that I saw on display. 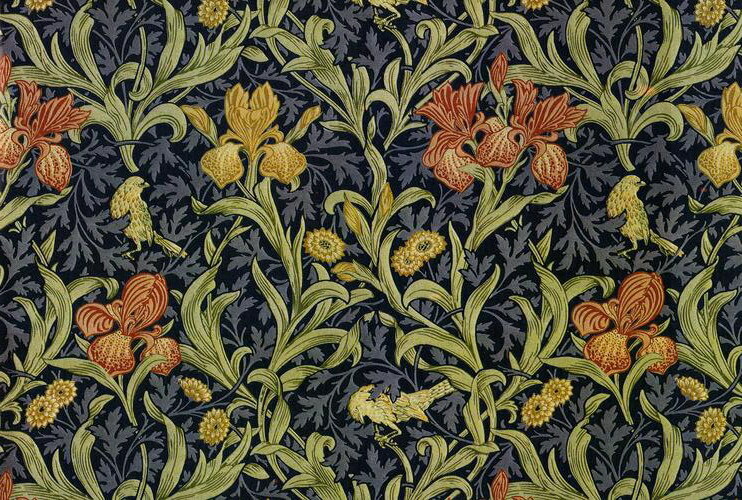 For example, the background design in Saint John the Baptist in the Wilderness is clearly referencing a William Morris print of birds and irises. As someone who loves William Morris’s designs, I would have liked to have seen this references explored a little more clearly. A review of this same exhibition from last year (when it was at the Brooklyn Museum of Art) also suggested that mentioning the origins of the backgrounds in Wiley’s paintings would strengthen the show. The reference to William Morris was most clearly pointed out to me in the portrait of Mrs. Siddons; the pattern is clearly inspired by the Blackthorn block-printed wallpaper that Morris designed in 1882. It seems like there are several reasons for why Kehinde Wiley chooses to reference William Morris’s designs in some of his paintings. On one hand, Wiley’s compositions and designs are trying to draw awareness to the realm of history and art history, not only with the decorative motifs but the way the figure is represented (the female figure’s position which looks away from the viewer reminds me of depictions of the penitent Magdalene by George de la Tour). In past centuries, fine art was typically associated with white Europeans and refinement. Wiley wants to challenge the idea that fine art and statements of cultural refinement are limited to a specific race; he does this by referencing European artistic traditions in his portraits of black people. To help emphasize his point, Wiley draws inspiration from Morris’s wallpaper designs, since they are associated with taste and the high-quality production surrounding the Arts & Crafts movement. In the exhibition catalog for this show, Annie Paul explains that Wiley creates “decorative backgrounds [which are] inspired by the English designer William Morris, who wove images from botany and zoology into intricate patterns signifying taste and discrimination.”1 It seems like Wiley occasionally uses Morris’s designs to reference English history and colonialism, too. For example, the inclusion of a Morris print in St. John the Baptist in the Wilderness (shown above) references the past colonial presence of the English in Jamaica. And what would William Morris think about his imagery being utilized in this way? I think that he would be quite pleased: Morris was a socialist who wanted to bring about a change in the art world and society. 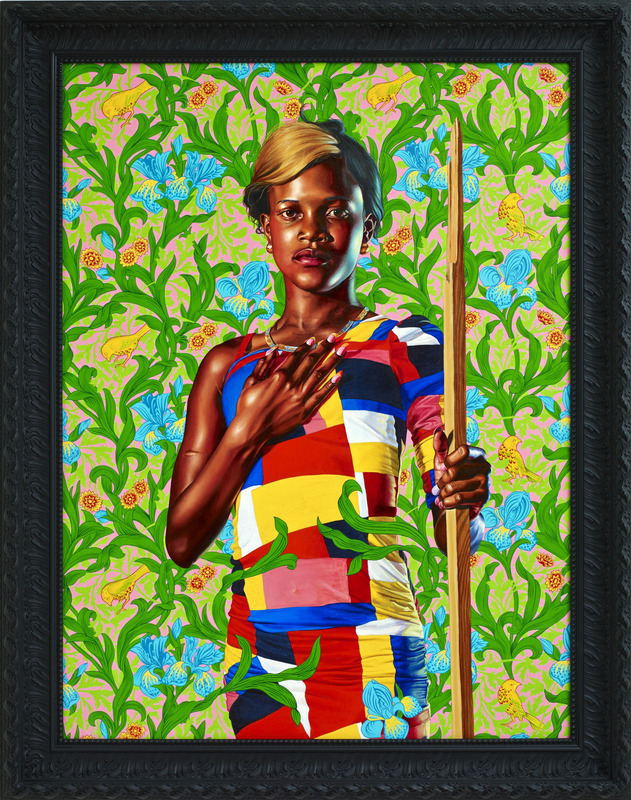 William Morris felt like the arts, particularly the decorative arts, “were ‘sick’ as a consequence of the split between intellectual and mechanical work that occurred during the Renaissance.”3 Perhaps in a similar vein, Kehinde Wiley seeks to bind together racial divides and “heal” stereotypical assumptions about what constitutes art and portraiture. 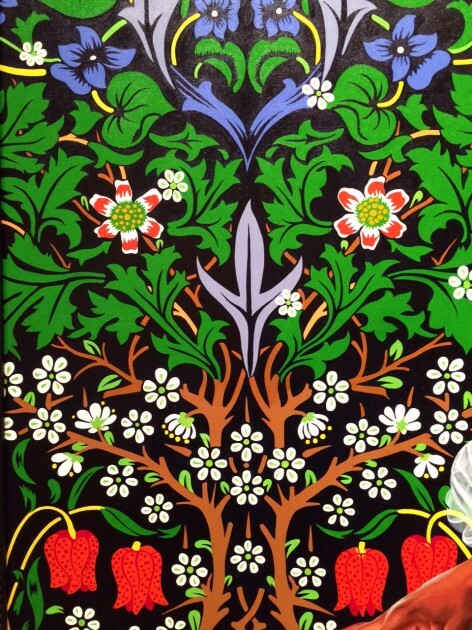 So when Wiley’s paintings are considered in terms of social unity, Morris’s designs are very appropriate. Art historian Caroline Arscott has analyzed Morris’s designs in relation to the social climate of his day, finding that the designs “imagine an overcoming of social contradictions in an allegory performed ‘through the twists and turns of plants.’ In this way his aesthetic stands as a powerful equivalent for the recovered wholeness of men and women, of their relations to their fellows and to nature.”4 In many ways, Wiley is also suggesting similar themes of “wholeness” by binding different cultures together within his paintings. It isn’t surprising, then, that Wiley is inspired by designs of plants which repeatedly interconnect, wind, and bind themselves to each other. 1 Holland Cotter, “Art in Review: Kehinde Wiley,” New York Times, December 9, 2005. 2 Eugenie Tsai, ed., Kehinde Wiley: A New Republic (New York: Brooklyn Museum, 2015), 146. 3 Steve Edwards, “Victorian Britain: From Images of Modernity to the Modernity of Images,” in Art and Visual Culture 1850-2010 by Steve Edwards and Paul Wood, eds. (London: Tate Publishing 2012), p. 81. One little-known fact about the painter Edouard Manet is that the artist traveled to Brazil as a teenager. When Manet was sixteen years old, he traveled to Rio de Janeiro aboard the Havre-et-Guadeloupe and subsequently spent several months in Rio. The point of his journey was to secure admission into the Navy and eventually pass the requisite admission exam, although neither of those things ended up happening. 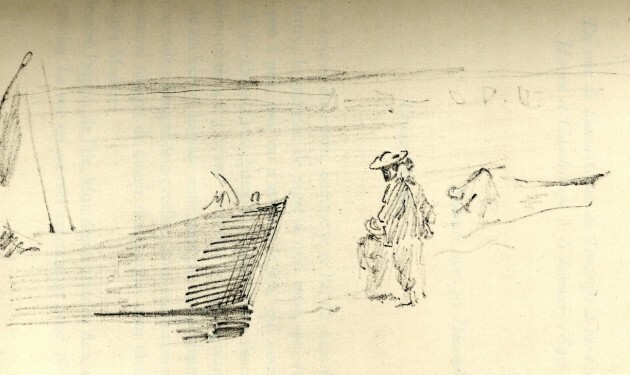 Travel conditions were difficult and the voyage took longer than anticipated: Manet left Europe on December 8, 1848 and docked in Rio de Janeiro on February 5, 1849. Poor Manet had to pass his seventeenth birthday while stuck at sea. 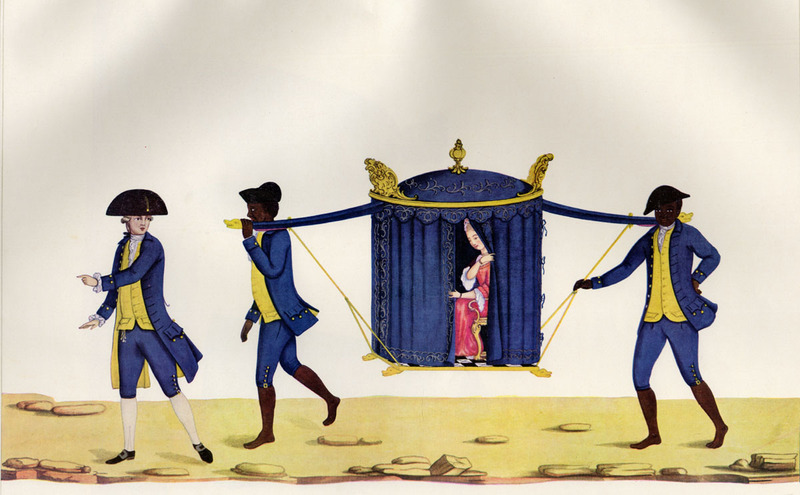 He also made various observations about Brazilian culture, including that women were carried around in sedan chairs (perhaps similar to what Carlos Julião depicted a century before in a watercolor painting, shown above). 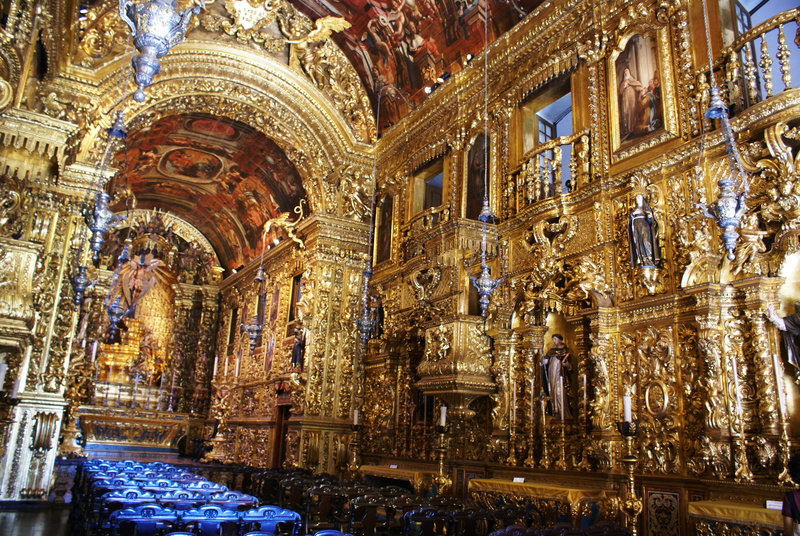 Manet also visited churches in the area, though he didn’t enjoy the highly-lit gilt interiors. He found the churches to be in poor taste, writing that “they do not stand up to ours [in France].”3 One can imagine how the colonial Brazilian aesthetic must have seemed excessive to the French teenager! Manet must have visited a colonial church like the Igreja de São Francisco da Penitência (interior shown below), or one very similar in style. In retrospect, translator Jean Marcel Carvalho França has said that Manet was one of the most significant individuals to set foot on Rio de Janeiro soil during the nineteenth century. (Which is why, I assume, that the Praça Manet, a public square with soccer fields in Rio de Janeiro, received its name?) You can read more about Manet’s impressions of Brazil in a Portuguese publication, with more information found HERE. 1 Ana Lucia Araujo, Brazil Through French Eyes: A Nineteenth-Century Artist in the Tropics (Albuquerque: University of New Mexico Press, 2015), p. 76. Available online HERE. 2 Beth Archer Brombert, Manet: Rebel in a Frock Coat (Chicago: University of Chicago Press, ), p. 28. Available online HERE.